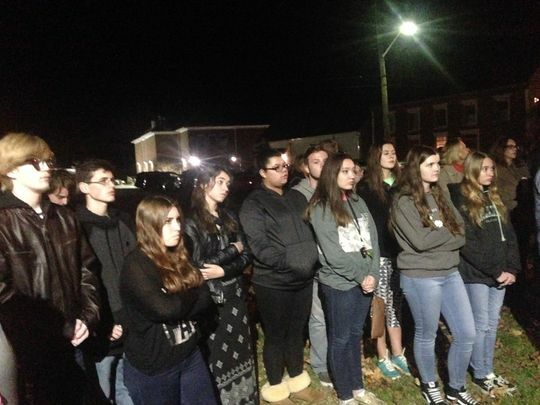 Accomack County students at a demonstration in support of the books. The classic novels To Kill a Mockingbird and The Adventures of Huckleberry Finn are back in school libraries and classrooms in Accomack County, Virginia today after the school board last night voted not to ban them in response to a parent’s complaint about racial slurs in the books. The board also formed a committee to review its challenge policy, which led to an unnecessary public relations firestorm for the district since it currently requires that challenged materials be pulled from circulation until the matter is resolved. That nuance was subsumed when the district faithfully followed its existing challenge policy, which says that “materials cited in the complaint will be temporarily suspended for use pending determination by the [review] committee.” While this may have seemed logical to those who first drafted the policy which was passed in 1994 and last updated in 2014, Accomack County Public Schools quickly learned why free speech advocacy groups recommend the opposite course of leaving challenged items in circulation while they’re under review. The spectacle of a school district pulling Mark Twain and Harper Lee from its shelves, even if they were likely to be restored later, grabbed national headlines which in turn led to a predictable backlash from visitors to the district’s Facebook page and even its Google reviews. Meanwhile, Accomack County students, parents, and community members also organized to defend the books. High school junior Sadye Sanders started a petition opposed to any potential censorship and gathered 170 signatures from fellow students before an administrator told her to continue her advocacy only outside of school grounds. Many more signatures were added during a public demonstration organized last Friday by parent Charles Knitter outside the Accomack County Courthouse. These novels are treasures of American literature and inspirational, timeless stories of conscience and bravery. We agree that some of the language used is offensive and hurtful. Fortunately, Accomack County’s excellent teachers and media center specialists have a wonderful talent for conveying the bigger meanings and messages of literature. Chagrined board members also formed a committee to consider an overhaul of the challenge policy which would “give the superintendent discretion to keep challenged books on library shelves while they are reviewed.” In the end, we are gratified at both the widespread community support for the freedom to read in Accomack County, and the school board’s ready recognition that its existing policy needs to be revisited. Good job all around!